I feel a little silly calling this “gazpacho” since traditionally this is a soup made out of tomatoes! 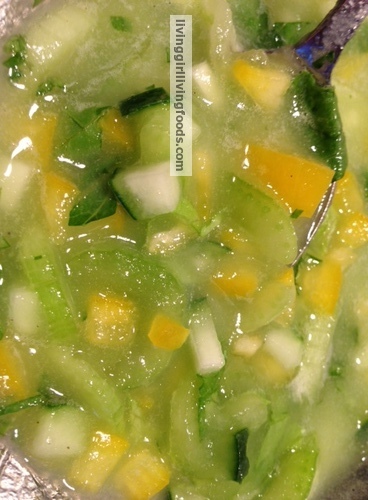 But like traditional gazpacho, this is served cold and is a delicious cooling summer treat. Just because gazpacho is served cold it does not mean that it is living/raw, just a heads up since I have had this conversation before with people. Gazpacho is an extremely old soup, it’s root go all the way to the Moors in Spain and Portugal. Gazpacho over the years has had amazingly yummy twists such as; watermelon gazpacho (my clients LOVE this one), seafood, grape, and green ones like the one I am sharing with you all today 😀 It may or may not have oils, sometimes they are cool yet spicy, the options and inspiration is endless! Generally speaking the main ingredients are tomatoes, water, garlic and herbs/spices. Oil & Nut Free :D! Blend and strain for a more clear and light soup, otherwise leave it a little thick if you would like! 1 tablespoon cilantro chopped, if you are allergic to cilantro try basil, parsley, mint or dill YUMMMY! Cucumbers have been noted to be an exactly hangover cure, people have shared stories of eating a few slices of cucumber before going to bed and feeling hangover free in the morning. I’ve had a few people share with me that they feel very awake after eating cucumbers so I decided to do some browsing to see why this happens. 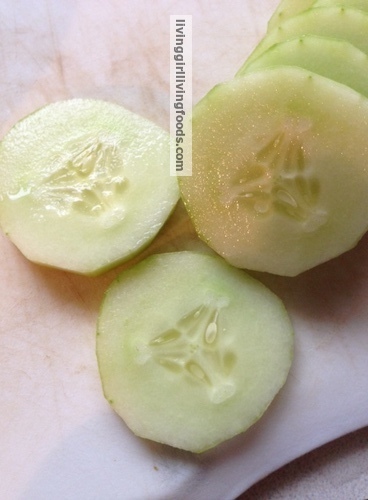 Cucumbers are an excellent source of B Vitamins, Electrolytes, and Carbohydrates. This can give that “pick me up feeling” some of us lack at times. Cucumbers are also rich in: Vitamin C, Folic Acid, Potassium, Magnesium, Iron, Phosphorous, and Zinc. Phytochemcials in cucumbers cause the collagen in our skin to tighten, this is why cucumber is commonly used in spa treatments, creams, and so on.